optional: applesauce, sliced fresh fruits or berries only if cooked and served the same day. Trim crusts from bread. Spray a 3 quart baking dish with a non-stick pan coating. Arrange half the bread on the pan so that the entire bottom is covered. In a separate bowl mix eggs, half and half, vanilla and sugar. Pour half of this liquid over the bread. In a separate bowl combine filling ingredients, except optional fruits, together until creamy. 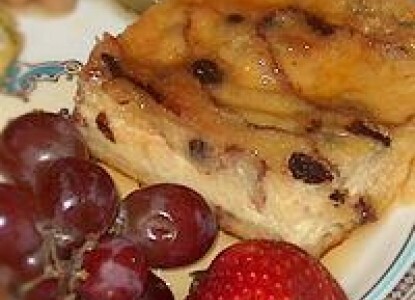 Pour filling over moistened bread, then layer with optional fruit if desired. Arrange other half of the bread over the filling and pour the remainder of the egg mixture over the top. Sprinkle top with dash of nutmeg. Cover and refrigerate overnight. Bake in preheated 350 degree oven for 60 minutes. Let stand 10 minutes before cutting into 12 rectangles to serve. Serve with warmed syrup or seasonal fruits.